James Bond and KGB Agent Anya Amasova personify "detenté" when they are assigned to work together on an extraordinary mission to prevent madman Karl Stromberg from initiating WWIII and establishing himself as dictator of an underwater civilisation in the aftermath of the destruction. North Norwegian Sea; London, UK; Moscow, Russia; Austrian Alps, Austria; Faslane Naval Base, Scotland; Atlantis, Sardinia; Cairo, Egypt; Luxor, Egypt; Liparus, Bay of Biscay. A British submarine is captured whilst at sea. The British Prime Minister and General Gogol are told that they are both missing submarines. The General calls for his best spy, Agent Triple X, and M asks Moneypenny to get Bond; who is currently in an Austrian mountains with a girl. 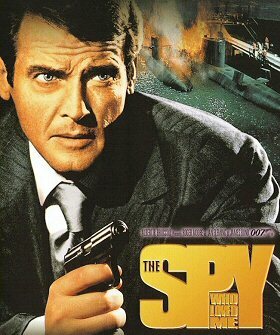 He gets the call and leaves the cabin on skies whilst the woman tips off her employers that Bond has left. A chase ensues and Bond kills several of the men before skiing off a cliff - only to descend with a Union Jack parachute. With such style and panache the only thing left is the theme music; which starts once the parachute opens. The title is not used anywhere in the film. Ian Fleming's controversial novel was written from a woman's perspective, and when he sold the rights to the movie series, he specified that nothing from the book could be used except the title. 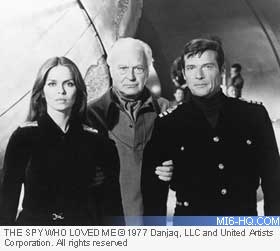 An early draft of The Spy Who Loved Me featured the return of Blofeld. That was nipped in the bud when Kevin McClory - who was preparing the ill-fated Warhead at the time - again threatened to sue. Jaws was originally set to die at the end by being either dropped into a furnace or killed by a shark, but was reprieved in the shooting script and lived to fight Bond another day. Cut in Sweden (about 90 seconds) when released theatrically. Some of the cuts are when Bond fights with Sandor, Bond fights with Jaws on the train, a fight by the pyramid and when Bond kills Stromberg. 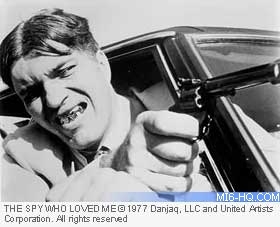 US network TV broadcasts over the years have handled Bond's shooting of Stromberg differently. ABC Network prints shown in the 1980s show Bond firing twice. The June 2002 showing on ABC edited out all but the first shot. Bond: "Maybe I misjudged Stromberg. Any man who drinks Dom Perignon '52 can't be all bad." When Major Amasova is first seen in the opening scenes, her beeper, disguised as a music box, plays Lara's Theme from Dr Zhivago. It was, however, a work which was banned in Russia at the time. The first time a woman utters the immortal phrase "...ooooh James!" JAMES BOND will return in FOR YOUR EYES ONLY"